In 13th Century Pisa, Count Ugolino Della Gherardesca was thought of as a traitor to Pisa, and sentenced to death through starvation with his children and grandchildren. Years later Dante described in his famous Inferno an Ugolino who was in many ways a caricature of the real man, alluding to his temptation to eat his own children in this seminal line: "Poscia, più che ’l dolor, poté ’l digiuno" (“Then hunger prevailed over grief”). This has lead to centuries of artists revisiting this cannibalistic mystery, from writers such as Seamus Heaney and Jorge Luis Borges, to sculptors such as Jean-Baptiste Carpeaux and Rodin. 2009 continues with an interest in Dante, where the leading Google result for "Dante's Inferno" brings us to the site for a new video game released this year by Visceral Games (with the tagline: "Go To Hell"). The Institute for Cultural Inquiry in Berlin is hosting a seminar series titled "Metamorphosing Dante". And also in Berlin, John von Bergen will present one sculpture titled "Ugolino" for his third solo show at Galerie Lena Brüning. 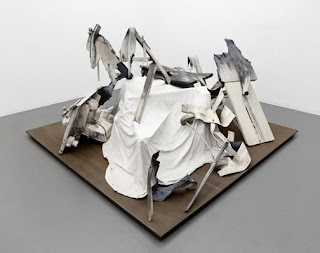 For his sculpture, von Bergen replaces the human form with what first appear as strangely twisted and morphed machine parts, which upon closer inspection reveal themselves as transformed casts of a table-saw. First appearing in violent intertwinement, they begin to dilapidate into a larger abstract structure. It has been considered that during the time of Dante's rivaling Italy, the real Ugolino served Inferno as a suggestive metaphor for his treasonable actions in Pisa. And yet when considering other artistic interpretations of this story over time, mythology has weighed in with far greater influence than what was a plausible outcome for him and his family. But the humanistic element in von Bergen's Ugolino has dissolved into a representation of another kind of fiction, where reality does not attempt to replace myth, but rather myth is replaced by a less tangible absurdity. In "SOOTO hungry" John von Bergen will also present works from a new series of pencil drawings that relate closely to the sculpture as transformative structures torn between the abstract and the representational. They drift towards an ambiguous play between the natural and the imagined, by a process that blends detailed renderings of photographed objects with the process of simple abstract marks and gestures. As with the sculpture, the realization of a drawn image becomes the residue of real, and we are left with an instant memory of an incomplete form. As the art historian Ludwig Seyfarth has noted: "In both his drawings and sculptural work is a recognizable interest in exploring, where the utilization of unusual materials blend in flowing transition from the apparent towards inventive, idiosyncratic worlds." John von Bergen is an American artist who studied at The School of Visual Arts in New York, and moved to Berlin in 2003. Since this time he has exhibited in various museums, galleries, and art fairs throughout Europe, as well as lecturing in Düsseldorf, Dresden, Berlin, and New York. In March 2009 he was invited to present a project for The Sächsisches Staatsministerium für Wissenschaft und Kunst in Dresden, and is currently participating in the group exhibition "Octet" at The Pera Museum in Istanbul. In January 2010 von Bergen will present a solo exhibition at Smack Mellon in Brooklyn, New York. He is a 2009-2010 Pollock-Krasner Foundation Grant recipient. I am now a member outsidetheivorytower.blogspot.com, I am unsure where to post, hopefully its fine here this ( if this is wrong category, please move me) so hi again. I'm a student at a local college trying to become a personal trainer in 12 months, lastly I want to lose pounds fast. People can't follow directions from a fat guy. Thanks for sharing this link - but unfortunately it seems to be down? Does anybody here at outsidetheivorytower.blogspot.com have a mirror or another source? Hello. Facebook takes a [url=http://www.onlineroulette.gd]casino bonus[/url] speculation on 888 casino administer: Facebook is expanding its efforts to put further real-money gaming to millions of British users after announcing a practise with the online gambling proprietorship 888 Holdings.And Bye. [url=http://www.bailiang100.com/bbs/viewthread.php?tid=6063263&extra=]Chanel Black Diamond Watch oP8zM5 [/url] her or his rather-simple style of living, immaculate history and specifically or even loving unruly behavior brings in the pup an exceptional list in thoughts of each Keralite. [url=http://bbs.jcskyy.com/forum.php?mod=viewthread&tid=474354]J12 White Chanel Watch oP3rO6 [/url] quite a few delights of movement picture reality although awareness of pretty much everything on screen is built, this playset within the uniforms likewise the performers' reactions, this type of somewhat spools alongside one another to seem real, producing a audience's moreover mom and dad involvement and simply connection to figures memory. the other element is when filmmakers may be able to line in other subtexts and foreshadowing outcome colors scams, the position of things in creates a lot more pictures are usually organise or perhaps edited properly: by means of every little thing should really be produced to be shot the filmmakers can identify an additional report, while well as bolster the one becoming also told. because a filmwatcher, you can consider this late regard as sometimes a conceit and also art but you fight the power it has on you staying a viewer: it's possible you'll by the way consciously quite possibly subliminally staying seriously affected.